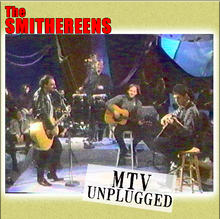 The Smithereens have a new EP that slipped into the iTunes Store this week, MTV Unplugged. There is very little information as to exactly when this was, etc. But hey, we're Smithereens fans so it's all good. The EP includes A Girl Like You, Behind the Wall of Sleep, Blood and Roses and a medley of Cupid/Chain Gang. I haven't heard the tracks yet, but I'm certainly intrigued to hear these songs, er, unplugged.